KZN music lovers are currently the beneficiaries of a new spirit of collaboration between Durban’s Friends of Music (FOM) and Christopher Duigan’s Pietermaritzburg-based Music Revival associations. This welcome trend saw the latter offering up a combination of two of its recent programmes that have been performed across the province, telescoped into one, for the benefit of FOM’s audience at the Durban Jewish Centre on Tuesday 10 April. WILLIAM CHARLTON-PERKINS reviews the event. An ‘easy lift-off’ was effected as the two musicians played an engaging coupling of Ave Maria settings by Caccini and Piazzolla. Du Plessis then stepped up to the microphone to introduce the Rachmaninoff masterwork. 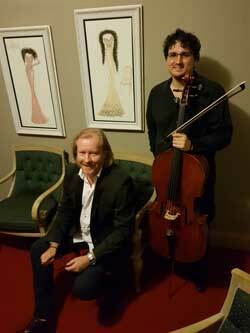 He highlighted the impact the work left on him as a nascent soloist, when as a young teenager, he heard the great Russian cellist Alexander Ivashkin play is at a FOM recital 13 years ago. The experience of being privy to Ivashkin’s account of the work is best encapsulated in Du Plessis’s own words, as recounted in an interview he gave me a while back: “He had the most beautiful, enormous tone which just made the hall spin. I was very moved, even as a child, by how every movement of the work had so many beautiful melodies, and of all different types - pensive, profound, heroic, tragic, desperate, romantic, and joyous. Every emotion and feeling is in this piece, especially the third movement. Mention must be made of the evening’s remarkable young Prelude performer, the gifted bass singer, Ruben Mbonambi. With a velvet-textured vocal instrument of rare and authentic tonal depth and colour, he delighted his audience with a beautifully phrased performance of Sarastro’s great aria, ‘O Isis und Osiris’ from Mozart’s The Magic Flute, and a deliciously knowing account of Don Basilio’s scurrilous aria, ‘La Calunia’ from Rossini’s The Barber of Seville. This amazing young man was accompanied by Bobby Mills.